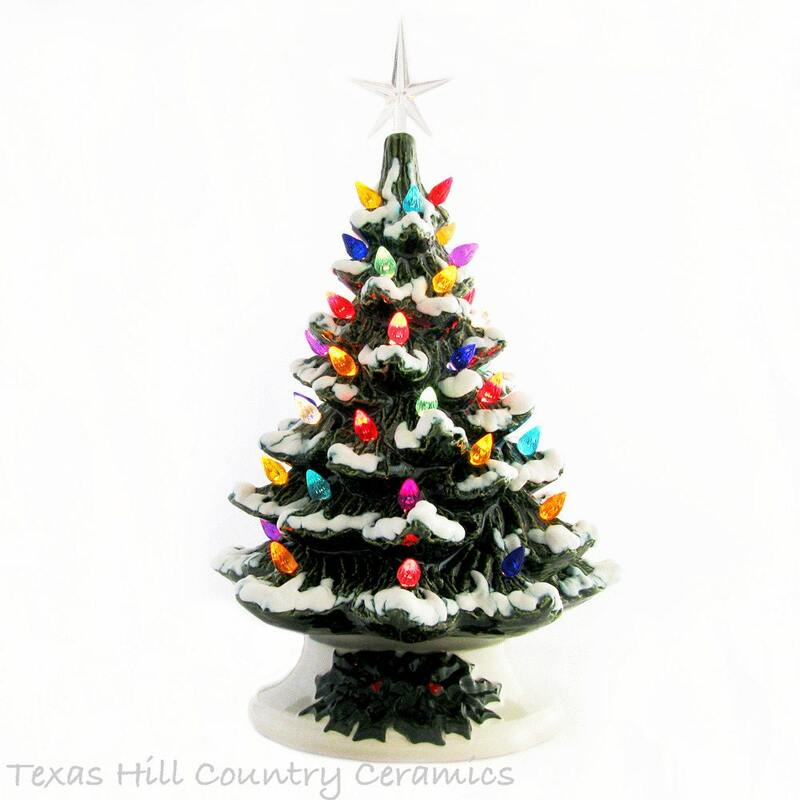 Falling snow on Christmas is a common wish and this ceramic Christmas Tree can help you with that wish. This beautiful hand made vintage inspired ceramic tree with snow tipped branches is one way to bring Christmas time to life this holiday season. 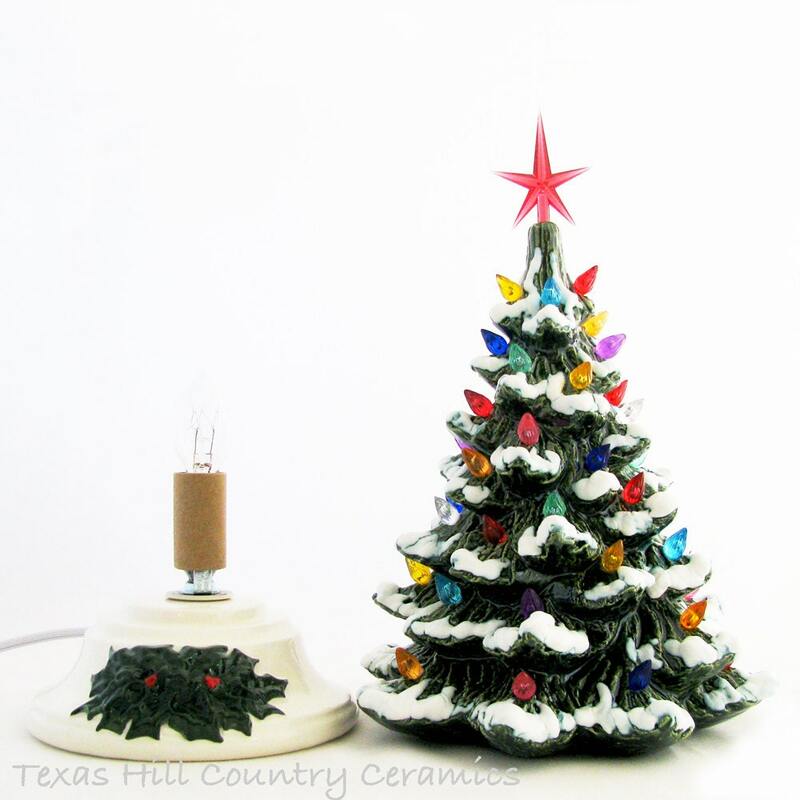 This traditional style tabletop ceramic Christmas tree is brand new tree but is made from a vintage mold dated 1986. This tree is made in my studio located in central Texas. The tree is decorated with nine colors of plastic lights and they include red, clear, green, midnight blue, aqua, pink, purple, gold and orange. The total finished height of this tree (includes the base, tree section and star) is approximately 11 1/2 inches. • Tree section measures approximately 7 3/4 inches tall and 6 3/4 inches wide. • Stand is 1 3/4 inches tall x 5 inches wide at the bottom. • Modern style star is 2 inches tall. The total height of this tree (including the base, tree section and star) is approximately 11 1/2 inches. This Christmas tree is glazed in a rich glossy evergreen art glaze and white snow that is kiln fired is added to the tips of the branches. The ceramic base is white and hand detailed enhancing the double holly leaf design. There are two separate pieces - the tree rests on the base so it is a snap to set up and take down. The ceramic base is wired with a permanent UL approved light fixture. On the cord is a rotating dial type switch so you can leave it plugged in and switch your tree on whenever you want. A steady burning 15 watt bulb is included. All bases are wired with a UL approved light fixture and plug that is standard for electrical systems used the USA. All light bulbs sent with the tree are for USA electrical systems as well. Please keep in mind each tree is hand made and has its own individual characteristics, no two are exactly alike. • The tree is glazed in green with snow tipped branches. • The snow is permanent kiln fired and will not change color over time. • The base of the tree is detailed. 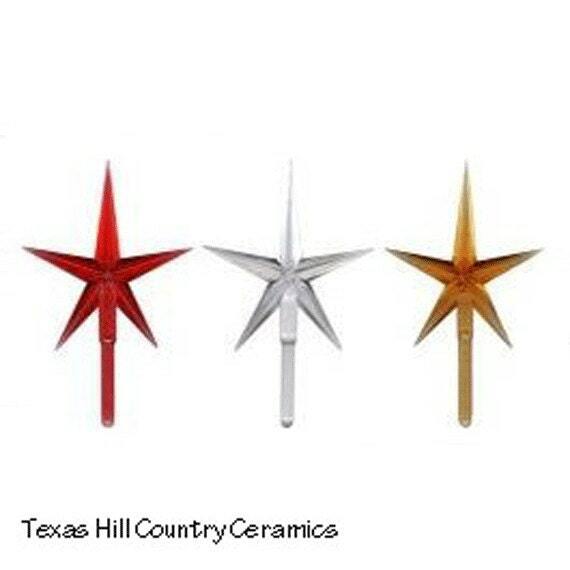 • Modern style plastic star of your choice (gold, red or clear). • UL approved electrical fixture with on/off switch on the cord. I love this tree! It's like the one I used to have! Beautiful! I only wish I had ordered a bigger size. Love love love it! Love it, wished I would have ordered the larger one! This tree was packaged perfectly. The tree is exquisite! My husband and four year old Granddaughter fell in love with it. It reminds me of the one my Grandmother had - just a little smaller. I would recommend this item to anyone. A true treasure! Thank you! Lovely tree beautifully made and packed securely. Thanks very much!